As a caregiver for someone who has Alzheimer’s, the very first thing you must learn is how to hide your feelings and emotions. You have to become an actress/actor because you will realize very early on that whatever you are feeling the person with Alzheimer’s will mimic. If you are upset, then they become upset. If you are stressed then they will become stressed. So learning to hide those feelings can go a long way to keep peace and harmony. It’s not always easy to do, but there is nothing easy about caregiving is there? Over time swallowing your emotions and feelings can lead to severe health problems. Things like ulcers, headaches, and depression can run rampart if you can’t find a way to let these feelings out. As my own mother sinks further into the Alzheimer’s grasp I see more and more how keeping things happy and calm can change everything. It can make the difference between a good day and a really bad one. A caregiver often times not only has to deal with the person who has Alzheimer’s, but also husbands, children, grandchildren, jobs, bills and a whole list of other responsibilities that we have to try and manage as well. It can become so overwhelming if you don’t have a safe place where you can talk about the things that are bothering you without hurting anyone’s feelings. A place where you can let your hair down and just be yourself. That’s why I have created a new Facebook group just for caregivers! It’s called a THE CAREGIVER’S CORNER. It is meant to be that safe place to land. A place you can slip into, take your shoes off, take a deep breath, and talk about your problems in a safe place where your words can’t and won’t be used against you. I want it to be a place where you can ask real questions and get real answers to your everyday problems. A place to seek advice, answers, and even a shoulder to cry on if that is what you need. If you know of a caregiver, or you are a caregiver yourself who would like to join a group where everyone is going through the same thing. 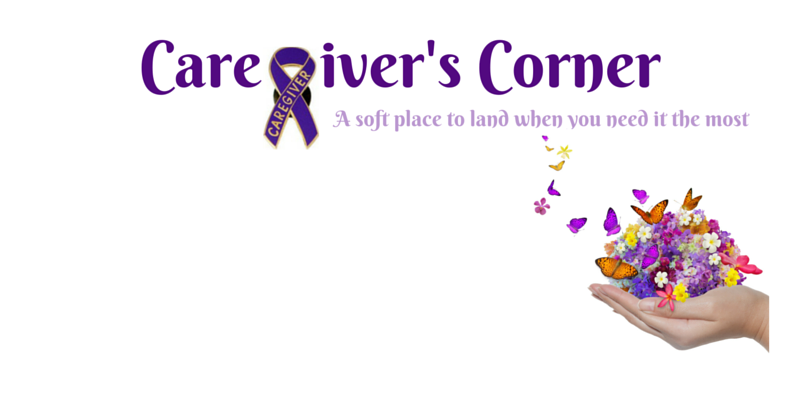 A group that knows what you’re dealing with and who understands the many ups and down that a caregiver faces then please tell them about THE CAREGIVER’S CORNER and request to join! « THE 2015 #WALK2ENDALZ IN GREENVILLE, SC WAS A HUGE SUCCESS! Support is so needed even for those not hands on daily caring for their loved one. Well done Rena! That’s true and honestly I think the ones that aren’t there to witness how their loved one is being treated would be so much more stressful. This is going to be such a blessing to so many, Rena. I’m going to share with one of my best friend’s who is currently helping care for her grandparents. Thanks Mandy! I hope she decides to join up. what a lovely idea Rena – I hadn’t thought about the concept of emotions being mimicked and the need to always be cheerful – it makes a lot of sense though. It’s true I’ve seen it lots of times. As long as I pretend to be happy and stress free then she is the same way. The minute I start worrying about things then mom becomes sick to her stomach with worry and it gets worse as the Alzheimer’s progresses. Sharing this with all the parents of special needs children in my local support group. Thank you so much Mithra! I really appreciate that. What a wonderful idea. I hope everyone who needs it finds peace and support there. What a sweet thing to say Karen! What a fabulous idea! It is so helpful to have a safe place to speak openly about your feelings and challenges. My husband and I just watched the documentary of Glen Campbell’s last tour which focuses on his battle with Alzheimer’s. It was eye opening and very heartbreaking to watch. I have that DVD, but I haven’t been able to watch it yet. I try not to bring attention to Alz in front of mom. She is so self-conscious about it all. What a great idea Rena. I wish there had been something like this when we were taking care of my mother in law. You are awesome. My own father suffered from Lewy Body Syndrome, Rena. Mum would have found such comfort here. I’m off to share. Thanks so much Kelly! I really appreciate it. It’s amazing to me how many people I’ve met whose lives have been touched by some form of dementia. Great idea especially since a supportive community is so important to the often neglected caregivers. Any additional source of strength and understanding will be priceless. Joy recently posted…Can Halloween Be Any Scarier? Thanks Joy! Spread the word! I agree Kathy! It’s a huge learning experience for me and I am trying to do all I can. What a great place to look for support! Wonderful Rena!